A lion, a hippo and a western bongo, oh my! 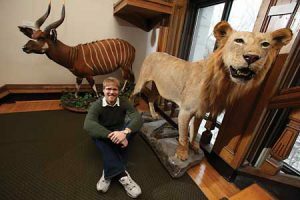 Last month, a collection of 72 African mammals was donated to the Redpath Museum, the only natural history museum in Quebec. Belonging to a single private donor, it included over two dozen different species of African mammals, ranging from some of the continent’s most famous large carnivores, the lion and leopard, to the smaller lesser known bush herbivores like the dik-dik and oribi (small antelopes). Something curious happened at the Redpath Museum recently. Almost overnight, an eclectic mix of stuffed and mounted African mammals turned up on its third floor landing. Nestled amongst an old gorilla specimen and the skull of a hippopotamus, new creatures, including a lion, a bongo, a leopard, an oryx, an eland and a hippopotamus, just to name a few, now wait to be admired. So just how did these fascinating creatures suddenly appear in the only natural history museum in Quebec? Last month, a collection of 72 African mammals was donated to the Redpath. Belonging to a single private donor, it included over two dozen different species of African mammals, ranging from some of the continent’s most famous large carnivores, the lion and leopard, to the smaller lesser known bush herbivores like the dik-dik and oribi (small antelopes). The entire group of specimens was collected and donated by Ghassan Jabre, an avid outdoorsman and hunter. Until they were moved to the Redpath, the collection was housed in the basement of his St-Lambert home. “Mr. Jabre collected the bulk of his specimens over nearly a decade, traveling eleven times to Africa, and his journeys in search of African wildlife led him to all four corners of the continent, including South Africa, Cameroon, Zambia, Zimbabwe and Tanzania,” said Anthony Howell, Curatorial Technician at the Redpath. Howell helped curate the new exhibit with Prof. Virginie Millien, who is on leave this term. When the team viewed the collection for the first time, they were surprised and delighted by the diversity and quality of the specimens. 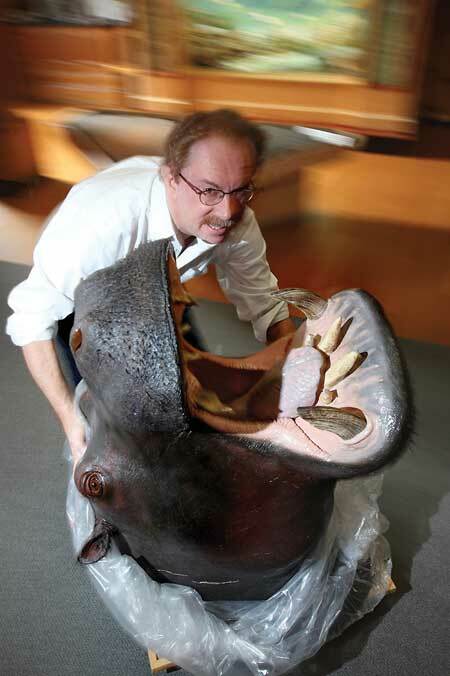 All the taxidermy had been carefully carried out by well-respected taxidermist Richard Bolduc from Quebec. There were a myriad of different species among the group that varied greatly in size and style. Working closely with Jabre on the project helped Howell learn more about the donor and his adventures. Jabre was careful to get approval from authorities to hunt in the vast game parks he visited and, when possible, would select animals that were already wounded or in a weakened state. He often encountered poachers on his trips, and regularly filed reports and gave statements regarding their activities and whereabouts to the proper authorities. On a few occasions, he personally drove off poachers.